Boulder City Parks and Recreation is offering a youth kickball program this summer. The coed league is for youths who just finished sixth through eighth grade and will be fun and fast paced, according to Steve Corry, recreation coordinator for the parks and recreation department. Kickball is a great way for teens and preteens to build fitness and social skills that can carry over to year-round and lifetime good health, he said. Players with any level of experience are welcome. Preseason clinics are planned. Games will begin July 7 and will be played on Tuesday and Thursday nights at Veterans’ Memorial Park, 1650 Buchanan Blvd. Play will begin about 7 p.m., depending on the number of teams. According to Corry, teams will be structured so that even if some players have out-of-town vacations, games can still be played. Teams will be organized by the recreation department and practices will be scheduled after registration concludes. There is a $20 registration fee, which includes games, equipment and a uniform. Those interested can register now through June 22. Boulder Dam Credit Union is sponsoring the program, underwriting costs to ensure fees are affordable for participants. For more information, contact the Boulder City Parks and Recreation Department at 702-293-9256. Nevada Veterans Assistance League is sponsoring a golf tournament June 27 at Boulder Creek Golf Club to benefit residents of the Nevada State Veterans Home in Boulder City. The day’s events begin with registration and check-in at 6:30 a.m. The shotgun start, four-person scramble tourney will start at 7:30 a.m. and be followed by an awards luncheon and raffle at noon. The entry free is $125 per person and includes golf, a cart, range balls, bag tag, awards lunch and tee gift. Additional lunch guests are $20 each. The deadline for entry into the tournament is June 12. Checks, payable to NVAL, should be sent to P.O. Box 60464, Boulder City, NV., 89006-0464. For additional information, contact Julie Boyster of the Nevada Veterans Assistance League at 702-332-6741. 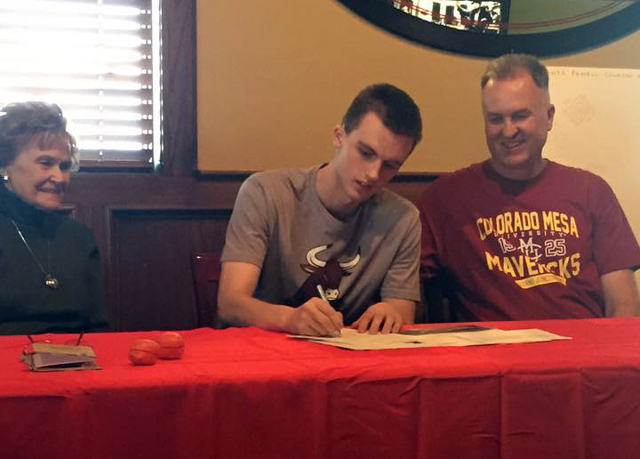 Danté Fewell, son of former basketball and track state champion, Doug Fewell, who graduated from Boulder City High School in 1981, signed a letter of intent to play basketball at Colorado Mesa University in Grand Junction, Colo.
A 6-foot-5-inch guard, Fewell averaged 15.6 points, 6.4 rebounds and 3.8 assists per game. A four-year varsity letterman, he was a starter for three years and received several postseason awards. He will study prephysical therapy. “I am very proud of Dante’s accomplishments as a basketball player, violinist and student. Most of all I am proud of the inspiring young man he is daily,” Doug Fewell said. Doug Fewell was a top basketball player; he was named player of the year and All-American while at BCHS, and was the assistant coach for the 1987 state championship basketball team.